The kitchen is the one room we spend most of our time in. We cook, eat, and gather in this room more than any other room. Naturally we want this room to look fantastic. I love the look of a modern farmhouse kitchen. It’s clean and inviting all at the same time. A modern farmhouse kitchen is a cross between the clean lines and look of modern and farmhouse charm. Some farmhouse styles can feel cluttered. A modern farmhouse style has large components of farmhouse and are minimal in the smaller details. In order to achieve a modern farmhouse look it’s helpful to think like a minimalist in ways. Useful large pieces for storage but less in way of knick knacks. In order to create our perfect Modern Farmhouse Kitchen we are going to look over a few of the things that matter most. Farmhouse Kitchen Cabinets or Shelving? Picking out which modern farmhouse kitchen cabinets will work best in your kitchen depends on what fits your style and your needs. You have three options to go with farmhouse style. Open shelving, open cabinets, or cabinets. The great thing about farmhouse style kitchens is you can do any mixture of these cabinet styles. You can have open shelving and clear cabinet doors. Additionally, you can mix open cabinets with regular cabinets. I love the look of open shelving. Open shelving gives a bit of a minimalist approach to storing your day to day kitchen needs like dishes and glasses. Home Made Lovely recently redid their kitchen and they installed this beautiful open shelving just above a coffee bar. Matching white dishes with clear glasses adds to the appeal of the room. By leaving the clear glasses on the ends of the top shelf and the white dishware and servingware across the bottom shelf and in the middle of the top shelf it draws the eye upward. This makes the room feel and look bigger than it actually is. While open shelving will automatically open up a room to make it feel bigger using that shelving to draw the eye upwards will expand it even more. 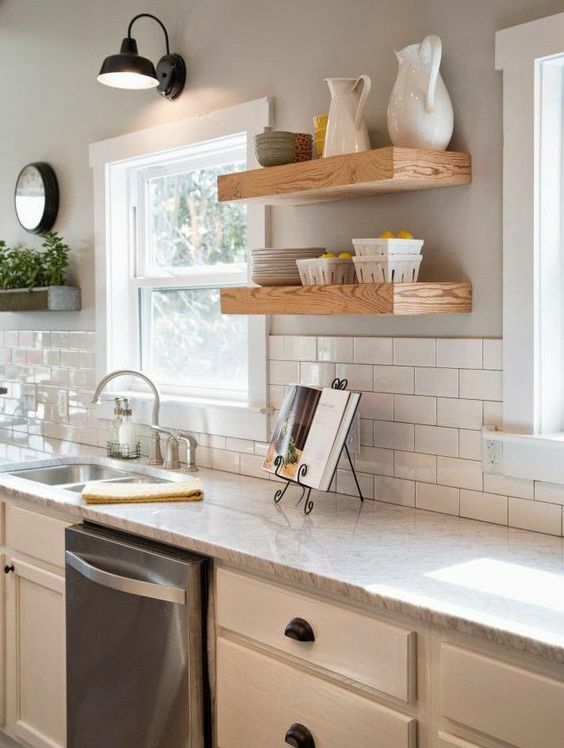 You can use floating shelves like these if you prefer the no bracket look. You could also switch out the brackets and add a touch of industrial to your modern farmhouse kitchen with pipe shelving. If you like the appeal of open shelving but fear for your glassware being so exposed you can try taking the cabinet doors off dressing up the inside and calling it a day. This is a frugal way to get the modern farmhouse kitchen that you desire. While the cabinets themselves can create a bit of a security in your glassware and dinnerware it may still make your kitchen feel smaller than it would with open shelving. Stick to white for the cabinets inside and out and white dishes and clear stemware to keep your kitchen feeling larger. Another option to give the appearance of open cabinets is to get glass cabinet doors. While this may mean extra cleaning of your cabinets it is still a clean approach to the modern farmhouse kitchen. While I love the look of open cabinets or open shelving I have two adorable felines that run amok in my house. Unfortunately, so does their fur. To avoid needing to rinse every glass or dish we use I have opted to always have closed cabinets. The purrs outweigh the fur when it comes to home decor in our home. Stick with an antique white or weathered look on your cabinets for that farmhouse look. However, make sure your handles are minimalist in design to keep that clean modern look to it. While your cabinets and small touches are extremely important to achieving your modern farmhouse kitchen, you can be a lot more flexible with your countertops. There are a few choices that I believe look best in a farmhouse style kitchen, they are not the only ones that work though. 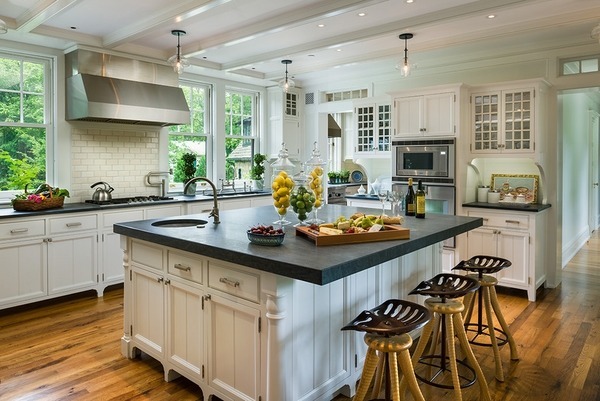 I personally love the look of wood countertops though they absolutely take some extra care with needing to be oiled down with mineral oil regularly. However, if you get a butcher top countertop you could chop directly on your counters without needing a cutting board. Plus wood is better for your knives than a glass or acrylic cutting board. The other appeal to a wood countertop is if you are using white cabinets and white walls the wood adds a beautiful rich tone to your kitchen. Having a large portion of your kitchen a rich wood breaks up all the white. If wood is not your style you might love the simple and extremely durable style of soapstone. The grey would contrast the whites of your cabinets while keeping it simple and clean. Soapstone is easy to clean, easy to care for, but a beautiful countertop. It has all the appeal of a more traditional stone countertop with none of the complicated care that goes into it. If all else fails a simple white countertop will work nicely in your modern farmhouse kitchen too. A solid white Corian countertop is a nice one. While they are not resistant to heat simple hot pads will do the trick in protecting them. Another way to add a splash of color or break up the white in your kitchen is by going with a different colored island like the one above. Doing this will make the kitchen island the focal point of your kitchen. Add fresh cut flowers to the center of your island to make it homey. Additionally, you can add stools around the island and make it a functional piece. I highly recommend going stainless on your sinks and appliances. Not only is it a modern feature for your modern farmhouse kitchen but stainless is so much easier to care for than white or black appliances. You could go with a sunk into the counter sink or a farmhouse sink. Either one will be a fantastic addition to your kitchen and continue with your modern farmhouse look. A modern farmhouse kitchen doesn’t have a lot of small pieces. They instead keep the farmhouse touch on larger statement pieces like cabinets and counters. Unfortunately, keeping your counters completely clear of clutter isn’t an easy task and it does sometimes leave the kitchen feeling empty. Small touches should be things like a glass pitcher with fresh flowers. Maybe one small sign above the sink. For convenience purposes, I leave my Kitchen Aid Mixer and my Instant Pots out on the counter because they are used often enough. Small appliances like these help to give the home a lived in and comfortable feel. Keeping this in mind you can consider creating a cute little farmhouse coffee station in your kitchen as well. Farmhouse kitchens can often feel cluttered so the modern farmhouse kitchen gets rid of that cluttered feeling. There is a balance that needs to be kept in order to keep the farmhouse look in your kitchen. Using larger statement pieces helps to solidify the farmhouse look without adding that cluttered feeling. A large sign above the sink or on a free wall will be just enough to add that touch of farmhouse without the clutter. If you have windows in your kitchen consider using a beige or white burlap or linen curtain to decorate the window. This fabric is extremely popular in farmhouse decor but won’t take away from the modern features of your kitchen. Finally, if you have an eat in kitchen, use linen place mats and napkins in your table settings. This will go a long way to completing that clean modern farmhouse look in your kitchen. The modern farmhouse kitchen is an extremely popular decor choice right now. I personally love the inviting feel of this decor. The modern farmhouse kitchen makes you feel like you want to cook in it and spend lots of times in it. There is nothing like serving up freshly baked goodies and gathering with your family in a clean yet comfortable kitchen. What are your thoughts on the modern farmhouse kitchen? Let me know in the comments below. Follow me on Pinterest for more like this and pin this to your favorite Home Decor boards.